This is a combination of moderate and easy treks. Starts from Phubjikha valleys at 3000 m, is in one of the few glacial valleys in Bhutan. It is chosen home of the rare Black-Necked Cranes which emigrate here in the winter from Tibetan Plateau in the north. The valley of Gangtey is one of the beautiful places in Bhutan and houses the century old Gangtey Monastery. The trek visits the village of Gogona and Khotokha passing through meadows, fields, and forests of juniper, Magnolia and Rhododendron. This is one of the finest low-level treks in Bhutan. -Visit the Memorial Chorten, a huge Stupa built in memory of the third King of Bhutan who had reigned from 1952-1972. Then we will visit the National Library where ancient manuscripts are preserved, we will also be making a trip to Wood Craft, Painting school where traditional art and craft are still well kept. 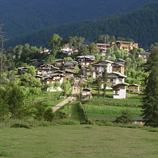 -Visit Simtokha Dzong, which is situated 6 Km from Thimphu. This Dzong was built in 1,629 AD and it is the oldest fortresses in Bhutan. Tashichho Dzong which is the seat of the Royal Government and the winter residence of the Head Abbot and the monastic school will also be visited. -Drive to Gangtey stopping at Dochu La to view the eastern Himalayan Range (weather permitting)- then we will be visiting Punakha Dzong. After visiting this Dzong we will continue driving to Gangtey. -After an early breakfast, we start our trek from 2,830 m, the trail leads to the South then goes west through meadows and fields. After a while it then climbs through a mixed forest of Juniper, Bamboo, Rhododendron and Magnolia. It then crosses a Tsela La (pass) at 3,440m and then crosses several meadows, then descends through forests to Gangak 3,020m. From here the trail to Gogona 3,100m is only a short climb. We will camp at a beautiful hill top overlooking the valley. -Trail turns gently up above Gogona village, past flocks of sheep and ploughed fields. Then we climb in to a forest of firs, oak, spruce, dwarf rhododendron, miniature azaleas, cypress and juniper. We then cross a pass Shobju La (3,410 m) from here the trail goes down overlooking the broad Khotokha – we will also visit four chortens dedicated to the four Je Khenpos. We will camp at 2,790 m.
-A short and bit of steep climb which takes it to Tashila (Pass) (2,800 m). The trail then goes down through ever changing vegetation into the valley of Dhang Chu. It is said that this stretch of trail is one of the finest bird watching areas of Bhutan. 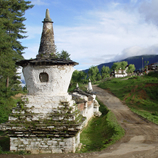 At Chuzomsa our vehicle will be waiting to be transferred to Paro which is around 55 km – 5-6 hrs drive. In the evening stroll around Paro town. -Drive up to Satsam Chorten (10 km from Paro Town) and walk to Taktsang Monastery.The name Taktsang means "Tiger's Nest.” The Monastery is perched on a rocky ledge with a sheer drop of nearly 400 mtrs and overlooks the Paro Valley. Taktsang is one of the most venerated pilgrim sites in the Himalayan world and it has 13 holy places. However, most people can only visit the main site called Taktsang Pelphug. According to legend, Taktsang Monastery was founded by Guru Padmasarnbhava in the eighth century. It is believed that the Guru alighted here upon the back of a tigress.